Eating plant based food during Passover is one way to take care of your body during the holiday. During Passover*, we can center your plate and your diet predominately with plant foods (fruits, vegetables, starchy vegetables, roots/tubers, intact whole grains, and legumes such as beans, peas and lentils (depending on if you Kinyot or not during the holiday). Here are 17 plant based recipes to enjoy during Passover. If you missed this delicious protein-packed salad earlier this month, have no fear! This high protein salad has it all: crunchy celery, sweet oranges and tangy cranberries. Its colorful appearance makes it a lovely addition to the meal. It is inspired by my cousin Jenny’s salad. This“old-fashioned” food is perfect for Passover breakfast or dessert because it is comforting and versatile. Tapioca is a lifelong food that can be enjoyed by everyone – from babyhood to old age. It is a gooey, creamy mouth food that is eaten by the spoonful. The added rum soaked raisins makes the dessert fancy and reminds me of my grandmother’s favorite ice cream flavor. These Matzah Tater Tots are baked, giving them a nice consistency. They are a bit crispy and be made during passover as a “matzo nugget” dipped in your favorite oil-free sauce or served as a topping on a lovely salad. Gluten free option given. Tzimmes is often part of the Rosh Hashanah meal when it is traditional to eat sweet dishes. 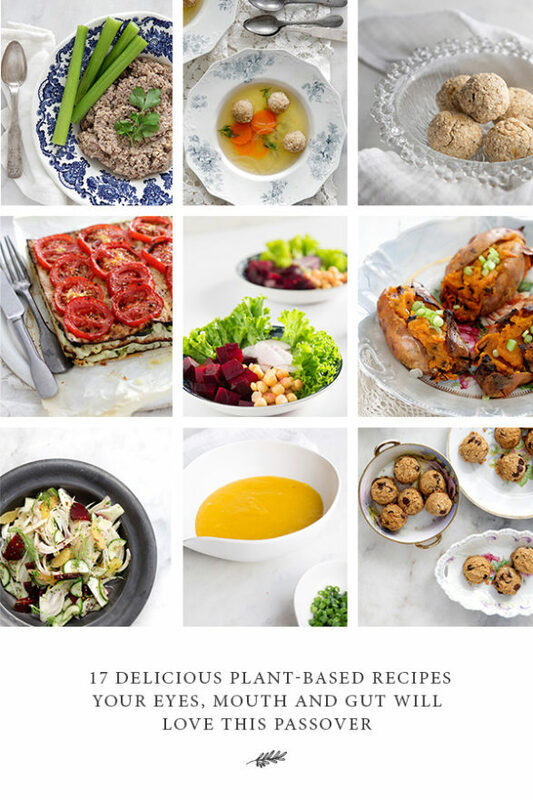 I’ve adapted a traditional tzimmes recipe with healthy ingredients that are all plant based. A refreshing coleslaw that is colorful and delicious. This coleslaw is healthy, as it is oil-free and mayo-free. Serve as as a side dish for lunch or dinner meals. It is a perfect salad to add to your Shabbat and holiday table. Serve cold. This salad can be made 24 hours in advance. Children and adults enjoy this soup. The recipe calls for a small amount of coconut cream – just enough to make the soup velvety. This soup can be served as an appetizer or as a main dish. This soup recipe is Pesach-friendly* and it can be enjoyed all year around. When people say “Jewish Food”, chopped liver is one spread that has a complicated reputation. Most people have a chopped liver memory or story that includes their grandmother, strong smells from the kitchen, and perhaps some commentary about kosher meat. I wanted a healthy version so I’ve adapted a traditional chopped liver recipe with healthy ingredients that are all plant-based. This layered mina combines savory mashed potatoes with sautéed zucchini and kale for a winning Pesach dish. This dish is the size of one matzo sheet. If you’re planning on serving this dish to four people or less, make one. In this version, the matzo balls are baked, giving them a nice consistency that holds up well in the rich broth. They are a bit crispy and could be made during passover as a “matzo nugget” dipped in your favorite sauce. Make 18 matzo balls with this recipe for 3 balls per soup. If you want to make large matzo balls or have extra, consider making double. This tomato sauce is fresh and light tasting as it is oil free and uses all fresh ingredients. It is so simple to make that you can enjoy it with a starch and vegetables during Passover. Lentil soup is delicious, simple to make and healthy for us. Red lentils in soup make a dairy-free creamy base for the soup, they cook quickly and I feel they are very easy to digest. The good news about potato fries is that they are made using potatoes. Most of us love potatoes because they are a satiating starch with lots of vitamin C, B6, and a fiber rich food. I call potatoes my “happy food” because they are a good source of vitamin B6. Regularly eating minimally processed potatoes or sweet potatoes without oil/butter/margarine or cheese does the body and mind good. This salad is filled with winter vegetables. It has a crunch from the cucumber and fennel and sweetness from the beets and oranges. The maple-mustard salad dressing is delicious and oil free. It looks lovely served over a bed of baby arugula or another green leafy vegetable of your choice. This satisfying and healthy chocolate “milk” can be made with plant based milk during Passover. It is so simple and pleases children and adults. Everyone from your kids to your husband to your mother and mother-in-law won’t be able to keep their hands off these. These cookies are Pesach friendly* and you can make them with either white beans or sweet potatoes (trust me on this) depending on your dietary preference. The recipe below yields a dozen cookies—which I can tell you from experience will go quickly—so make two or three batches for the holiday, depending on how many guests you’ll be hosting. These 3-ingredient vegan and gluten-free treats are easy to make, delicious and healthy. Your children will love them and they’ll enjoy helping to make them as well. I make them all year long and keep them in my freezer. They taste like a healthy “Snickers” bar. This recipe was inspired by a treat that can be found at the Vietnamese market in Ho Chi Minh City. Your Turn: Which plant based passover recipe will you try this year? *Pesach traditions vary widely, and some foods are eaten only in some communities on the holiday. This menu assumes the broadest definition of Kosher for Pesach ingredients.